How many times have you doubted yourself? Thought you weren’t enough? Doubted your greatness? 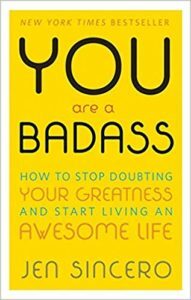 This book is excellent it talks about our negative self-talk and how we can turn that into something powerful. How our dreams can become a reality if we stop listening to the naysayers and the part of our brain that says we can’t and prove that we can! What would happen if instead of comparing ourselves to others and just did the things we thought we couldn’t do? We are all energy and if we do not tap into that source energy life becomes a series of the same things over and over. That is unless we tap into the abundant energy that is available for us. Sober living is about more than just putting the chemical or substance down, it involves changing thinking and behavior with healthy habits. That course you always wanted to take, take it. The trip you’ve been putting off, go on it! The cooking class you said you weren’t going to be good at, do it! How will we know unless we try! The title of this book says it all! If you are a rut or trying to pull yourself out of a bad place. Pick it up, you will not be disappointed!